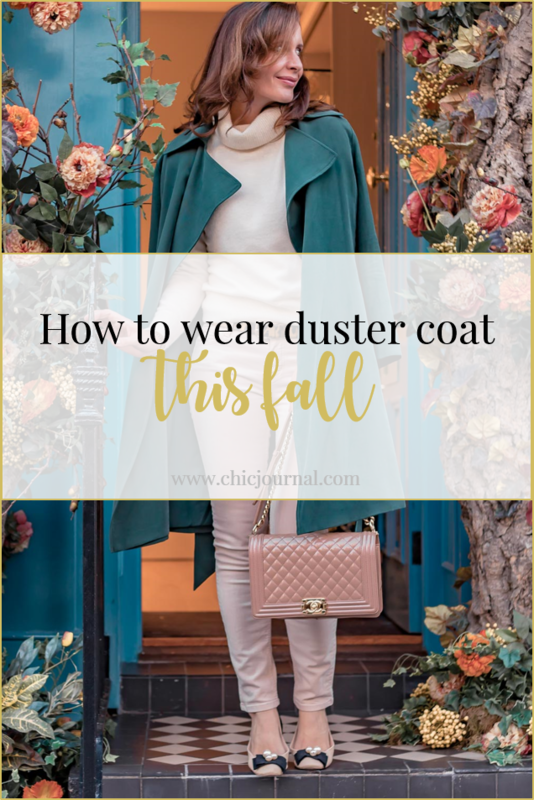 Duster coat is a perfect piece of clothing you need for the transitional dressing in the fall. 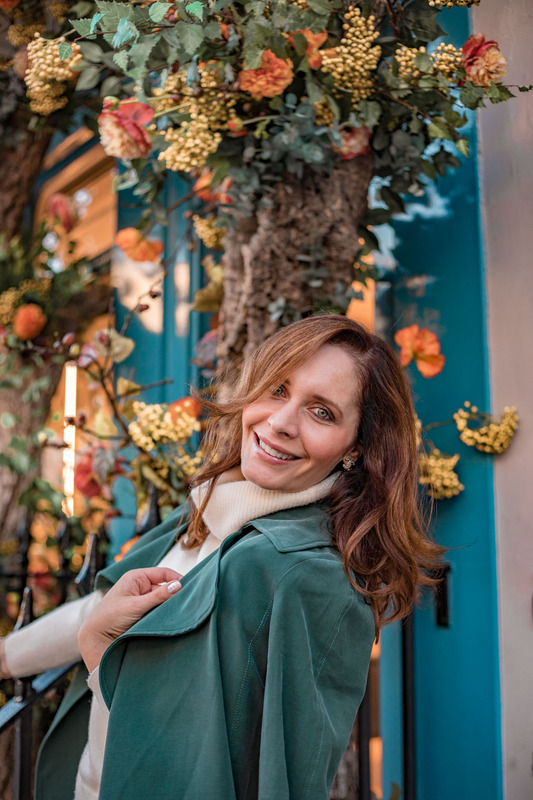 Duster coat is usually made of slightly lighter fabric than trench coats so they are more flowy. Also comparing to the trench coats, they tend to be less structured and without buttons. What i like about it, is how versatile they are. You can dress them up and down, with heels or sneakers. I got my duster coat in Club Monaco and I am obsessing about it right now. The colour is called, I think, bottle green and even though I was slightly reluctant at first, I was persuaded by the charming girl at Club Monaco in Chicago (where I bought it). 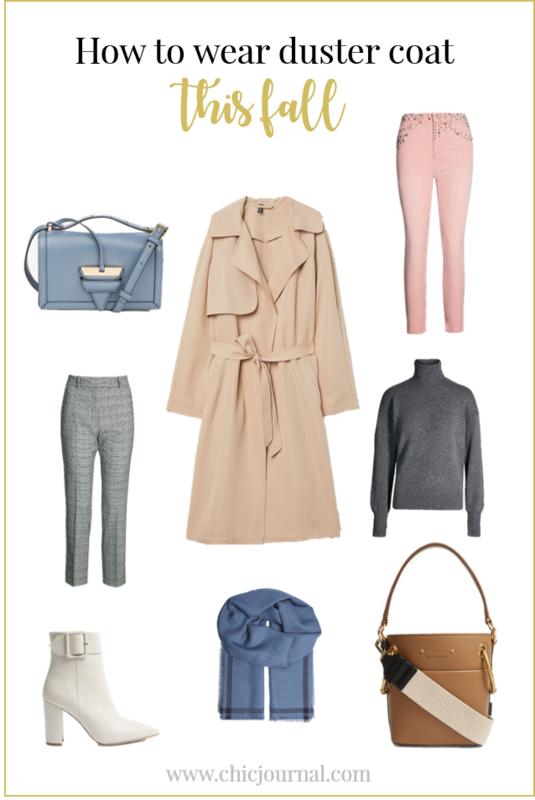 My favourite combination is with cream jeans as it makes the duster coat to stand out more than with dark colours. It is one of the pieces I kind like to throw on. I think it makes every outfit slightly more relaxed than a classic trench coat, don’t you think? When you are choosing a duster coat, the rule number one is to pay attention to the fabric. Make sure you are choosing a little bit thicker fabric. Also try to choose one that is fully lined. Most of the well priced ones have no lining and that is fine but if you can, find one with lining. Because the style and cut is very flowy, very thin fabric it can look cheap. On the pictures I was wearing my Club Monaco coat with Massimo Dutti cream jeans and Uniqlo cashmere sweater. My belt is Dolce Gabbana and shoes Carolina Herrera. I teamed it with Chanel Boy bag. I generally like to wear it with trousers better than skirts. The reason is because I think the style is less structured than a trench coat. Even though there are duster coats made of satin or silk, which goes quite well with dresses or skirts, I just wouldn’t choose them. But when it come to trousers, any style goes. You can wear it with office suit and well as weekend pants or jeans. My personal favourite is to wear it with jeans. 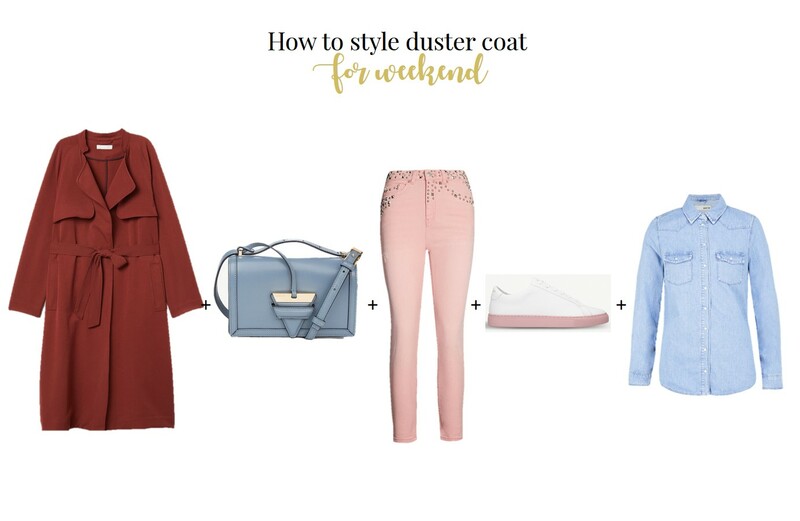 And just to give you more options, here are two more ideas how to wear a duster coat. 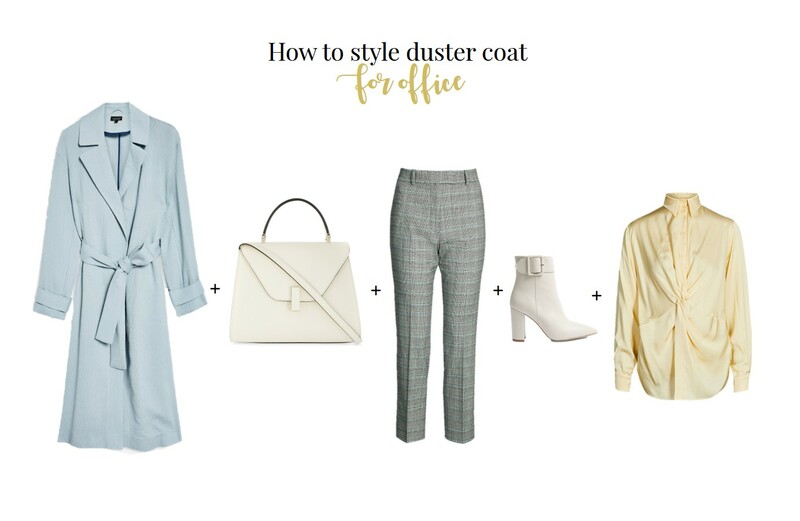 I created one outfit for you, that you can wear easily to the office and one for the weekend, when you want to be more casual. For the office I chose lighter colours. 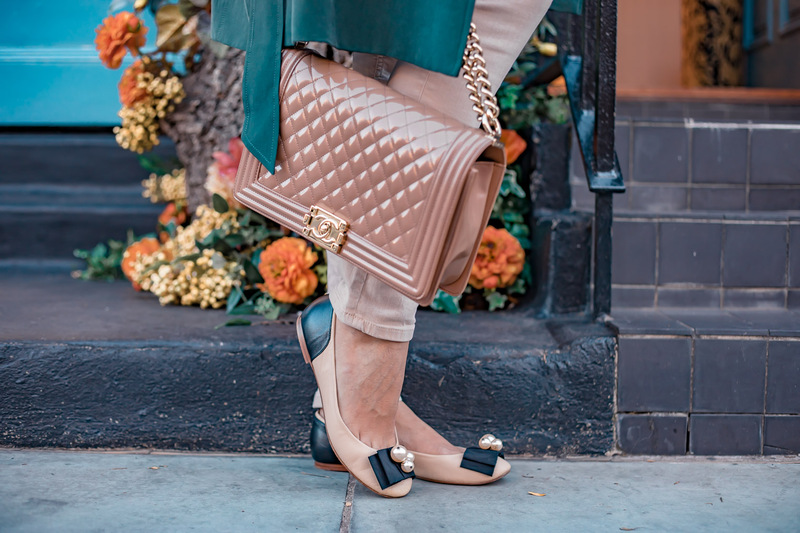 Even though it is autumn already and we tend to wear now a lot of darker colours, I think this combination is fresh and you will stand out more. One of the biggest trends right now are checked clothes, like the jackets I wrote about here. This time I chose checked trousers as they are great for looking smart on the office. I particularly love the beautiful Valextra handbag, which will make you feel and look powerful. For the weekend I chose more relaxed look with denim shirt and pink-ish jeans. My favourite are the two colour sneakers with pink sole. They are very versatile and while being very comfortable, they look chic. Previous Post Afternoon tea at Sketch Gallery in London. Is it worth the price?